Creamy Alfredo Sauce is a slight variation on your traditional Alfredo Sauce. You might wonder how do you make Alfredo Sauce. How is this different creamy Alfredo Sauce Different? I add a variety of hard Italian cheeses and 1 egg yolk. 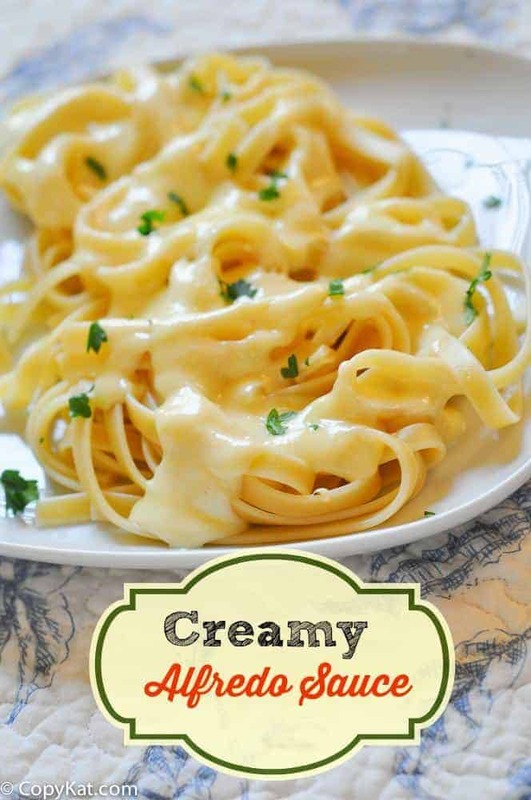 The result is a creamy Alfredo sauce that tastes wonderful. Alfredo Sauce is so easy to make, so you don’t need to wonder how to make Alfredo sauce. Whenever people ask me for an easy recipe, I always suggest Alfredo Sauce. While it may not be the healthiest meal to have, it is great for low carb people, and it is good in moderation. How you make this creamy Alfredo sauce, is pretty close to the standard way of making Alfredo Sauce. We are going to heat butter and heavy cream together; I like to do this in a skillet. I think this helps to distribute the heat evenly through the sauce. Once the sauce just begins to bubble, I like to then add in the cheese. The change in this recipe is that we are adding 1 egg yolk into the sauce. You might wonder why we add the 1 egg yolk into the sauce. It makes the sauce very rich, and it helps to thicken the sauce. I thought this was an amazing addition to this sauce. The egg yolk also helps give the sauce just a little bit of color. The sauce becomes a little more yellow with the addition. I think this a wonderful addition to this sauce. I have one more big tip when it comes to making homemade Alfredo sauce; that is GRATE YOUR CHEESE. No, grate your cheese. Cheese that comes pre-grated has anti-caking agents in it. Ever wonder why that cheese that you buy pre-shredded isn’t in a glob? It is due to anti-caking agents. Please, don’t use the stuff in the can, I have a can in my pantry. I use it thicken spaghetti sauce, or to flavor meatloaf. My preference is always cheesed that you grate yourself. My grocery store, Kroger does sell in store grated cheese, and that’s ok to use, but please no packaged pre-grated cheese for this recipe. Do you ever wonder what type of pasta you should use for Alfredo sauce? I know a lot of people like to make the Alfredo sauce with fettuccine. There are many other types of pasta shapes you can use for Alfredo sauce. Some favorites of mine are tortellini, rigatoni, and even pasta shells. Pasta that has a lot of shapes and turns makes great pasta for Alfredo sauce because it picks up extra sauce. Truth be told, I have even make this with spaghetti in a pinch. What makes creamy alfredo? An egg, an egg makes alfredo sauce extra creamy. Heat a medium sized skillet over medium heat. Add butter and cream into the skillet. Stir to blend together the melted butter and heavy cream. Add white pepper and nutmeg to the cream mixture. When the sauce just begins to bubble add 6 tablespoons of cheese and stir in. Add 1 egg yolk and mix quickly. When the cheese has melted turn off the heat and serve immediately.Note: This sauce does not reheat well. I put in too much dairy but the flavor was great and ill use this again but measure next time! Was very disappointed tonight! Made it for Valentine’s Day dinner for my husband but did not come out anything like alfredo. Read the recipe over and over. Not sure what happened. I am so sorry, can you tell me how it turned out, maybe I can help you. Adding a yolk sounds interesting and adding more than Parm is sounding yummy. I may try it someday. I buy grated cheeses by reading the ingredients and all work lovely; that melt great and blend smoothly. Good wishes in reading labels and finding the cheeses that work for you and your recipes. Thank you for the tip on some Parmesan cheese, not including anti-caking ingredients. I guess we should read the package, for me it is remembering to simply buy it in chunks and grate is myself. I hope you enjoy the recipe. I made this sauce for dinner tonight and it was very good. Thanks for sharing! I didn’t have any white pepper or nutmeg, but it was still very good. While good, the sauce isn’t as “saucy” as I would like once added to my pasta. Is there a way to get a creamier sauce? Also, I saw the note about the sauce not reheating well. Why is that? Thanks! I meant to say the sauce doesn’t reheat well. The emulsification breaks down, so the butter and the cream separate. If you want it more “saucy” maybe you want to add a little more cream. Also, instead of using the egg yolk for “extra creaminess”, try a dollop of cream cheese. Same affect ,and you “don’t have to worry abut egg turning to scramble…Also, this will keep better on a very low simmer, while your pasta finishes cooking. If I’m having a busy holiday dinner, I actually can make my Alfredo sauce “the night before”, then heat up on low just before I need it. I also cook my pasta(use a bow tie, for a large crowd”. Its easier to handle…I cook that up the “morning of a dinner party, I LEAVE in the collander, then I “let it “sit in the sink while HOT water runs thru it, to reheat it. Yikes, sour cream in Alfredo? I don’t know. To avoid scrambling the egg yolk, everyone should temper eggs when dealing with warm ingredients. Always. (That just means slowly add small amounts of the warm ingredients to a separate bowl with the egg, rather than add an egg to a giant hot space.) The only tip that should have been added to this already great recipe. Katie, WHERE do you see “sour cream”??? She said CREAM CHEESE. Yes, Olive Garden Alfredo sauce is , well “ok”, if you happen to get it “served HOT. As soon as it “begins to cool slightly, it becomes sticky”, and the butter separates from the cheeses. It’s “really awaful taken home “as a leftover”. I haven’t had some good alfredo pasta in a long time, can’t wait to try this tomorrow. I recently moved into my own apartment after having roommates who all made cooking pretty hellish. Went and bought everything I need along with some chicken and garlic bread. It is one of my favorites too. What is your favorite type of pasta sauce? Sautee your “thinly sliced baby Bella’ in real butter, then add to your sauce.I have even used Bertello’s “JARRED Mushroom Alfredo sauce” in a PINCH!…I just “docto it up with a “bit more “half and half”, and I DO grate a mixture of fresh Romano/asiago and parmesian”. I also kept a chunk of EACH in my frig.